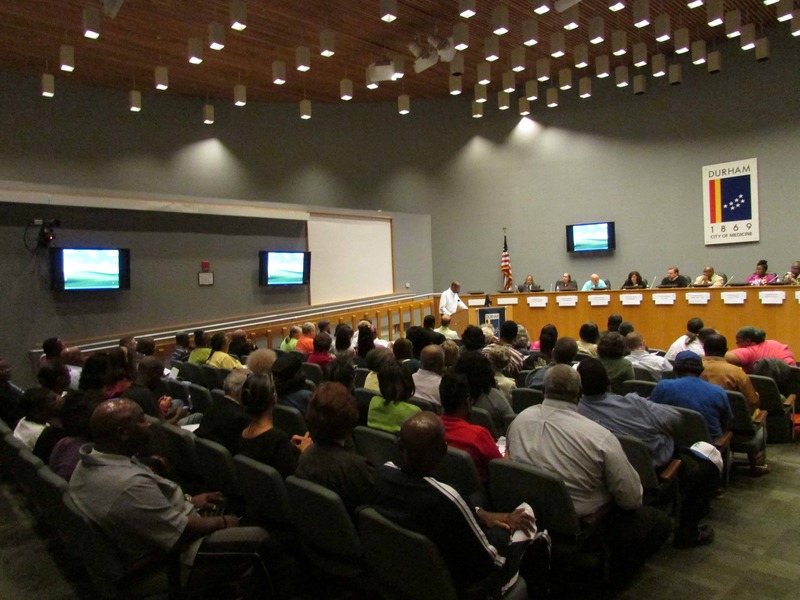 In response to FADE’s ongoing efforts to bring to light troubling reports of racial disparities and bias in the Durham Police Department, Mayor Bell convened the Human Relations Commission on Tuesday October 1, 2013 to hear from the community. As the meeting commenced, there was a palpable sense of urgency and somberness among the packed audience. In a orderly and quiet manner, a steady stream of community members, eighteen in all, came before the Commission to speak. They were an impressive cross-section of Durham—old and young, black and white, the primly and casually dressed, all united by a desire to make the community they love work better for all people. With three minutes to address the 15-member Commission, speeches ranged from those highlighting SCSJ’s recent Durham PD Racial Profiling data to emotional pleas regarding the perilous state of young black men in Durham. One white pastor talked of “two Durhams”, one where he was able to do drugs freely as a Duke undergrad and another where a black neighbor was unable to get police to respond in a timely matter to a missing child report. When he called on her behalf, the police promptly responded. This combination of data and personal stories of ill treatment at the hands of law enforcement was a potent mix. While Commissioners asked no questions and made no comments, it is hard to imagine they could have sat through the testimony and not been deeply moved and alarmed. 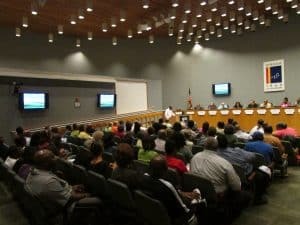 At one point, one speaker addressed the Commissioners directly, rhetorically stating that all of the African American members knew what he was talking about, that they had either experienced police mistreatment because of their skin color or knew someone that had. Want to get involved? You can visit the FADE Facebook page to learn more and attend the group’s next meeting. You can also email shoshannahsayers@southerncoalition.org to join SCSJ’s Criminal Justice Reform Initiative email list and receive regular updates.